Eat Anything! The catch? You can skip deciding what to eat! We'll make the decision process easier for you! You will never know what's coming! Always had problems deciding on what to eat? Your significant other gives you the power of choice, but immediately rejects everything that you suggested? 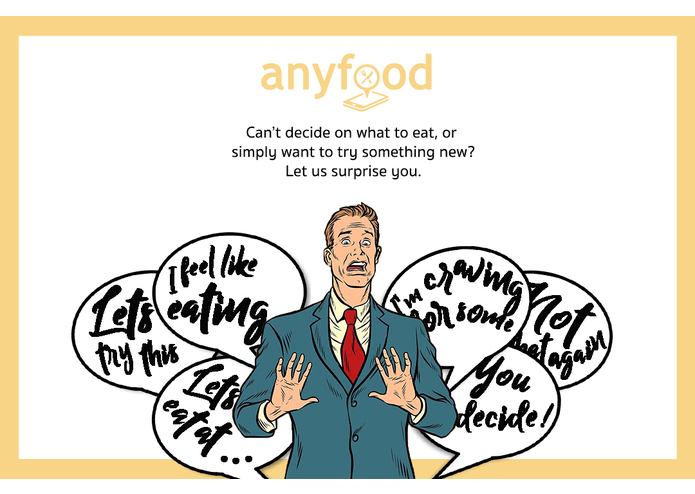 Anyfood is here for you. User first has to select a theme with accordance to their mood at that point of time. Cheat Day You've worked hard for the whole week, you deserve a break. Nobody will know. It's just a secret between us. Savour every single moment of it, because tomorrow, everything goes back to normal. Healthy Foods Feeling lethargic and need the energy boost so that you can last the whole day? Healthy Foods is the way to go! 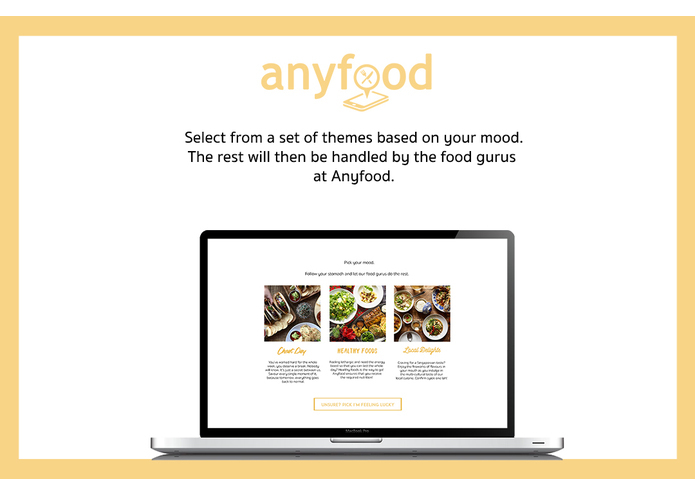 Anyfood ensures that you receive the required nutrition for the day! Local Delights Craving for a Singaporean taste? Enjoy the fireworks of flavours in your mouth as you indulge in the multi-cultural taste of our local cuisine. Confirm syiok one lah! User then selects the budget for the meal, which consists of Humble ($), Satisfying ($$) and Memorable ($$$). User then filters out their dietary needs, which consists of Vegetarian , Vegan , Halal and Beef. User then fills in the number of pax, as well as location where the food will be delivered to. Upon confirmation of details, algorithm will filter a list of food items that fulfill the customer's criteria. Algorithm will then randomly select a food item. Price of food item and estimated time of arrival will then be presented to the customer, while information regarding the food item will be hidden. Upon confirmation of order by customer, the ordering of food will be executed. Took 2 hours to center the text in our main HTML page.